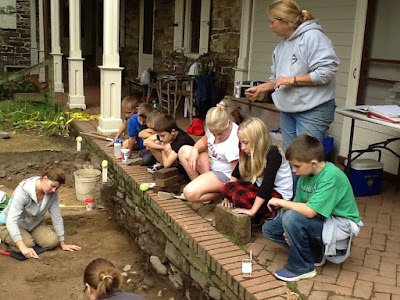 With this year’s field season at Fort Hunter Mansion and Park behind us, we continue our look back at archaeological projects conducted by The State Museum of Pennsylvania over the course of the last half century. This series is intended to dove-tail with the broader celebration of the 50th anniversary of the construction of the William Penn Memorial Museum building in Harrisburg, which houses The State Museum of Pennsylvania and the executive offices of its parent state agency, the Pennsylvania Historical and Museum Commission. A number of posts in this series previously detailed the excavation of stratified prehistoric sites in advance of large, federally funded or permitted development projects, such as Sheep Rock shelter (36Hu1) for the Raystown Reservoir (Army Corps), and 36Da50 in anticipation of the construction of the Three Mile Island nuclear reactor (FERC). 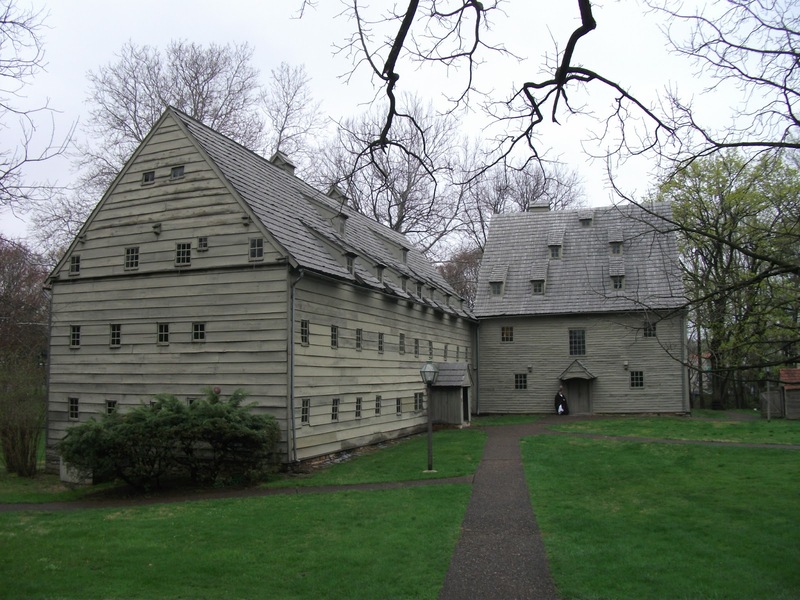 This week, the focus will be on the decade long historical archaeology project that took place at Ephrata Cloister, an 18th century religious commune in Lancaster County, now a popular historic site that has been owned by the Commonwealth since 1941. 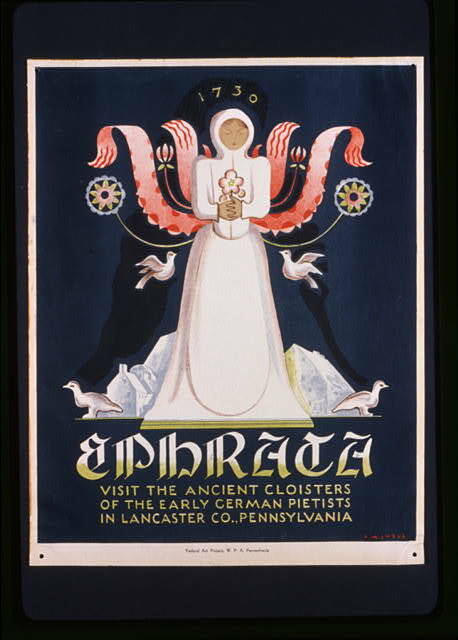 The formation of the Ephrata Cloister community was the direct result of a founding policy of William Penn’s nascent colony, that of religious tolerance. Nowhere else in colonial America were the conditions such that a social experiment like that of the Cloister was possible, thanks to Penn. Political and religious upheaval, and the accompanying economic hardships faced by marginalized groups throughout Europe in the late 17th century, spurred many to seek a new beginning across the Atlantic. Such was the case with Conrad Beissel, a German immigrant who would come to settle in Lancaster County around 1730 seeking a more meaningful spirituality through solitude and piety. The charismatic Beissel soon found himself the leader of a small, but industrious group of like-minded people that would comprise the Cloister community. 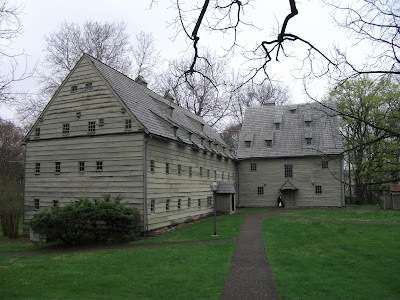 While spiritual purity was the primary focus of the cloister’s celibate brothers and sisters, some of the activities they engaged in include agriculture, print making, fraktur art, and among other industries, the construction of large dormitories and prayer houses, some of which survive today and have become icons of this National Historic Landmark. In the late 1980s site administrators expressed concern that adequate measures had not been implemented to protect the massive wooden structures, some of them at this point approaching 250 years old, from the threat of destruction by fire. Steve Warfel, then Senior Curator of the Section of Archaeology at The State Museum of PA, was contracted to perform an archaeological survey of the proposed fire suppression line across the property in an effort to identify any significant subsurface features relating to the site’s early religious commune activities. From that initial scope of work would emerge an annual historical archaeology field school, conducted in the months of June and July, which instructed dozens of college students in the methods of excavation, recordation and artifact identification. Over the course of eleven seasons, hundreds of thousands of artifacts were recovered, and several no longer extant buildings were relocated on the landscape, enhancing and enriching the story of the Cloister (including its time as a hospital during the American Revolution), and sometimes challenging long held assumptions about the behavior of its inhabitants. In an important final step after each season, Warfel published his findings in accessible booklets (still available at the Cloister gift shop) detailing the remains of structures discovered and their associated artifacts, in order share insights gathered with parties interested in this special piece of colonial American history. This week’s post serves as a mere introduction to the Cloister and a number of interesting facets about its members and their interactions with each other and with non-members locally and regionally. Outside of Warfel’s archaeological booklet series, numerous books have been written about Ephrata, If your curiosity has been piqued, please refer to the suggested reading list below to dig a little deeper. Benson, Cynda. Early Illuminated Manuscripts from the Ephrata Cloister. Northampton, Mass. : Smith College Museum of Art, 1995. Garvan, Beatrice B., and Charles F. Hummel. The Pennsylvania Germans: A Celebration of Their Arts, 1683-1850. Philadelphia: Philadelphia Museum of Art, 1982. Lamech and Agrippa. Chronicon Ephratense: A History of the Community of the Seventh Day Baptists at Ephrata. New York: Lenox Hill Publishing, 1972. Reichmann, Felix, and Eugene E. Doll. Ephrata as Seen by Contemporaries. Allentown: The Pennsylvania German Folklore Society, 1953. Sangmeister, Ezechiel. Leben Wandel: Life and Conduct of the Late Brother Ezechiel Sangmeister. Ephrata: Historical Society of the Cocalico Valley, 1979-1985. Secor, Robert, ed. Pennsylvania 1776. University Park: The Pennsylvania State University Press, 1975. Warfel, Stephen G. Historical Archaeology at Ephrata Cloister. Harrisburg: Pennsylvania Historical and Museum Commission, 1993-2003. Weiser, Frederick S., and Howell J. Heaney. The Pennsylvania German Fraktur of the Free Library of Philadelphia. Breinigsville: The Pennsylvania German Society, 1976. At the beginning of the 2015 field season, we had 3 goals for the Fort Hunter excavation: investigate the icehouse to verify its function; to clean up and clarify the foundation east of the icehouse believed to be the octagon shaped smoke house; and to open new excavation units by the mansion to seek out any evidence of the block house beyond the foot print of the mansion. As usual, our investigation plans for this year were greater than our staff and loyal volunteers could handle although we made a valiant try. Our screens were humming, producing over 12,000 artifacts but the opening of new units or features was not as extensive as we had planned. In the block east of the milk house (see below), we were able to expose the complete foundation of the building we think is the octagon shaped smoke house referenced in an 1828 account, unfortunately most of the other features in this excavation block were not tested. 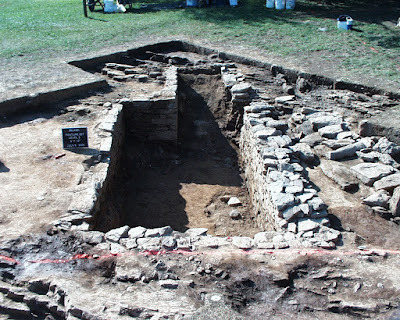 We discovered that the south and east walls of the stone foundation were in much better condition than the north wall which appeared to have been disturbed or “robbed”. The octagon smoke house with a circular foundation and the attached structure containing the stove to introduce the smoke. We troweled around Feature 110, situated in the middle of the circular foundation and found a charcoal/organic stain covered with a mix of topsoil and subsoil (“A” & “B” horizons). It appears that the dark stain was in the bottom of a hole and covered with fill. The smoke for this octagon shaped smoke house was reportedly introduced from a stove outside of the building. This charcoal stain may be the remains of a square shaped smoke house that preceded the octagon in which the smoke was generated from inside. A partial excavation of this feature last year produced a few possible 18th century artifacts and will require careful study next year. Our investigation of the structure formally known as the “icehouse” and now labeled as the milk house was significantly more rewarding. Our first indication that it was not an icehouse came early in the season while excavating the deeply stratified prehistoric horizons west of this structure. These investigations revealed that the foundation was less than six feet deep which did not agree with the historic account that describes the icehouse as over 15 feet deep. Following the removal of the wooden floor boards and exposing a tightly paved brick floor, followed by auguring beneath the brick, it turns out the brick was laid on a thin disturbed soil layer followed by the natural soil profile of Pleistocene sands and cobbles. In addition, a closer look at a recessed hole in the west wall revealed that it had been patched from the outside with cement – probably placed there when the building was upgraded in the 1970’s. In our re-analysis of the building’s function, it’s placement over the edge of the well foundation is significant. It is hypothesized that water was pumped from the well, through the hole in the west wall and into wooden containers that held cans of milk, cider or other liquids to be cooled. These were periodically emptied and the running water drained out the back of the building. Finally, we removed several rows of brick from the floor along the west wall of the milk house and exposed the interior builder’s trench and a disturbance in the southwest corner. The well is situated just outside this corner and the excavation of this disturbance may date the well, date the milk house and elucidate the functional relationship between these two structures. Dating these structures is extremely important for reconstructing the arrangement of buildings and their functions during the early McAllister occupation. Next year, we will probably excavate the entire builder’s trench and, if necessary, the disturbed soil under the brick floor to recover a datable assemblage of artifacts. Currently, we only have an 1828 reference to the well, milk house and octagon shaped smoke house. However, we believe the well is the oldest of these structures and probably was one of the first structures built by McAllister or possibly Mr. Hunter at an even earlier date. Now that the milk house has been completely exposed on the interior and the bottom of the exterior exposed on two sides, our intern from Elizabethtown College, Mary Clyne, is completing scale drawings of the walls and floor. These will be digitalized to accurately document the structure and hopefully clarify how it functioned. The Excavation along the porch brought us back to the 18th century occupation and the investigation of frontier life in Pennsylvania. Four (5x5 ft.) units were placed along the brick porch of the McAllister mansion. The first soil layer was the typical 19th and 20th century “A” horizon that we identify as Strat 1 and is found across the site in this area of the yard. Below this soil, a lighter brown “A” horizon was uncovered that we have labeled Strat 2. These two soil strata were identified during our first season at Fort Hunter and they are found south of the milk house and for the most part are absent in the excavation units east and west of the milk house. Strat 2 lies directly above the “B” horizon that is designated Strat 3. Although 19th century and non-diagnostic artifacts such as rusted metal, nails and bone dominated the collection, more 18th century artifacts were recovered from these units than all 15 units opened west of the milk house. 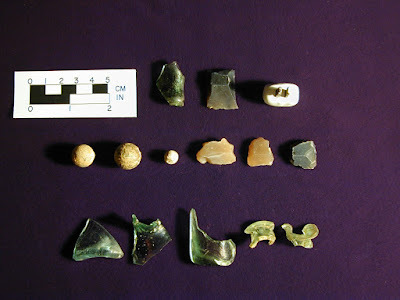 The list includes gunflints of French and English flint, musket balls, tin-glazed earthenware, brass scrap and most interestingly, several early 18th century glass trade beads. There are references in the historic record that Mr. Hunter was trading with the Indians and these artifacts hwlp support the historic account. We were unable to complete the porch trench and did not reach the “B” horizon subsoil although a transitional “A”/”B” zone was exposed. Most of Strat 2 is deeper in the porch trench than elsewhere and it may represent a large depression or hole in the 18th century surface. Next year, we will continue in this unit and expand it to the north and east. Both historic and prehistoric archaeology tests hypotheses and explanations of past cultural behavior. In addition, historic archaeology is a process for testing and verifying the historic record. To a degree, it is a more objective examination of history than documents alone. This season, we were able to correct the historic record and develop a more accurate description of the McAllister functional arrangement of buildings. As usual, we resolved some issues but discovered new ones. To summarize, next year we will continue working inside the milk house to date this structure and better understand its relationship to the well. We will expand our excavation along the porch as this area contains a high density of 18th century artifacts that may relate to the fort site or either the Hunter or McAllister occupations. We will also further define the features around the smoke house. We are starting to get a better picture of the cultural landscape of Fort Hunter. Mr. Hunter and Mr. McAllister were true entrepreneur and we are beginning to uncover the early projects that made them and their families successful. Finally, our other goal at Fort Hunter is to show the public how field archaeology is conducted. Towards that end we interacted with over 2700 visitors this season.